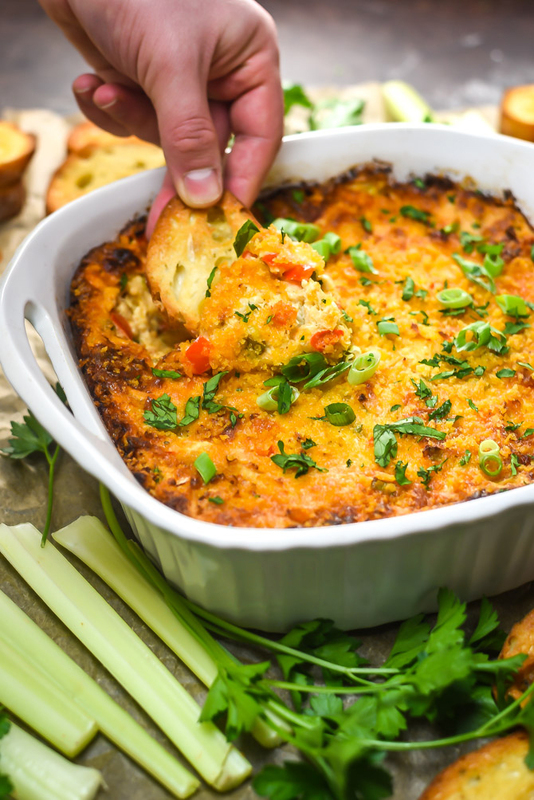 Call me a bad influence if you must, but I’m going to distract you all from your kale for a second and present you with this flavor-packed, melty, decadent crab dip. I went on a 5 mile walk in the morning. I had a fruit-packed smoothie for breakfast. No mortal, no matter how iron-willed, could possibly resist the allure of the plastic container of cheesy, bold, spicy crab dip that cried out to me from the fridge. I’m convinced. Yesterday was day 2 of realizing that it’s way too packed in the gyms this week to fight for a treadmill, and way too cold to walk outside no matter how much I bundle up. This was a problem because I’m trying to balance out the month of nonstop cookie testing I did back in December, and the the ton of Super Bowl recipes I’m working on now, and I’m giving this whole “New Year’s resolution to be healthier” thing a valiant half-effort this year. So I did what any responsible, dedicated [maybe senior?] citizen would do, and I went to the mall to walk around with my step tracker. Have you ever done that? My years of experience working in the mall say that if you’re under 65, the answer is probably no. My experience in the past few days hasn’t done much to change that impression, either. But I did it, and it was actually pretty wonderful. Got a coffee while I walked around, chatted with a few people, drank the aforementioned smoothie afterward, came home to a container of crab dip waiting for me… 10/10 would recommend. If I’m being honest, the crab dip was definitely a vital part of the equation. I’m dreaming about it– not the smoothie or the walking or the morning coffee–now that I’m snowed in today. Oh by the way, I’m snowed in today. Send help. Send wine. Send crab dip. Send a snowblower. Eh, just send crab dip. 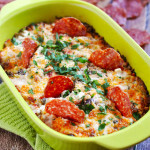 I’m such a sucker for warm, cheesy dips. They’re my absolute favorite party food and definitely my guilty pleasure (and no, that’s not changing just because the calendar year did). 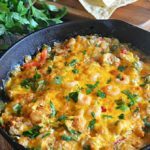 And when it comes to cheesy dips, this one pretty much can’t be beat… Unless of course you don’t like seafood. In that case, I don’t really know what you’re doing here but I’m happy to chat your ears off– or eyes off?– anyway, because I always enjoy your company, friendo. 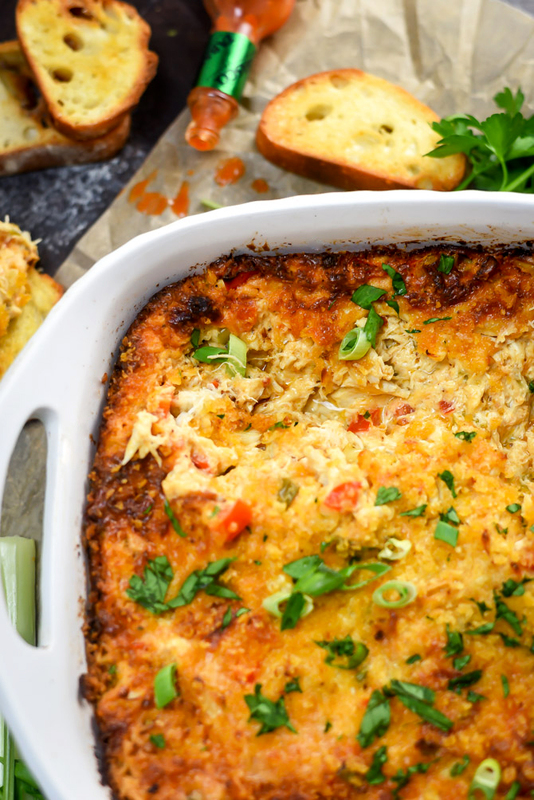 But for all of you crab-lovin’ lovelies reading along: this Hot Cajun Crab Dip is FULL OF IT. It’s not vaguely crabby. It doesn’t use fake crab. There’s 100% real, delicious sea-tasties in every bite. A guaranteed party hit. 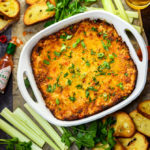 Another thing that makes this dip great for parties is that it’s got just enough of a kick to keep it interesting without being overwhelmingly spicy. 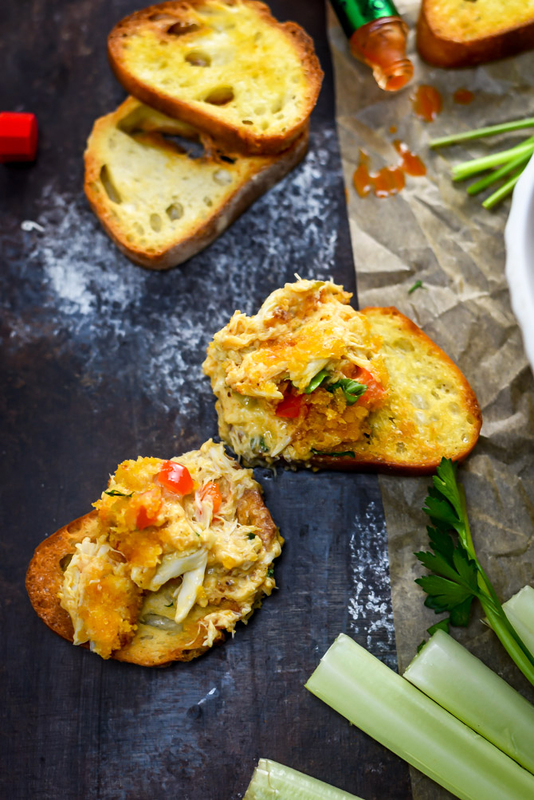 There’s the perfect amount of hot sauce, horseradish, and seasonings to balance out the slight sweetness and richness of the crab and not a drop more– so if you want to serve a bold dip with not too much eye-watering mixed in, this is a recipe you’ll absolutely love. The toasty breadcrumb layer on top is just the icing on the cake. 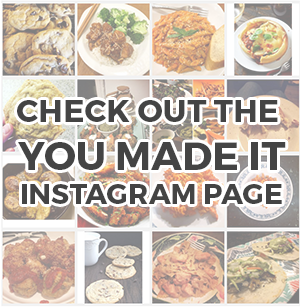 If you’re trying to be good for the new year, make this your cheat meal and savor every succulent second of it. Make it again for the Super Bowl. Make it again for your birthday. 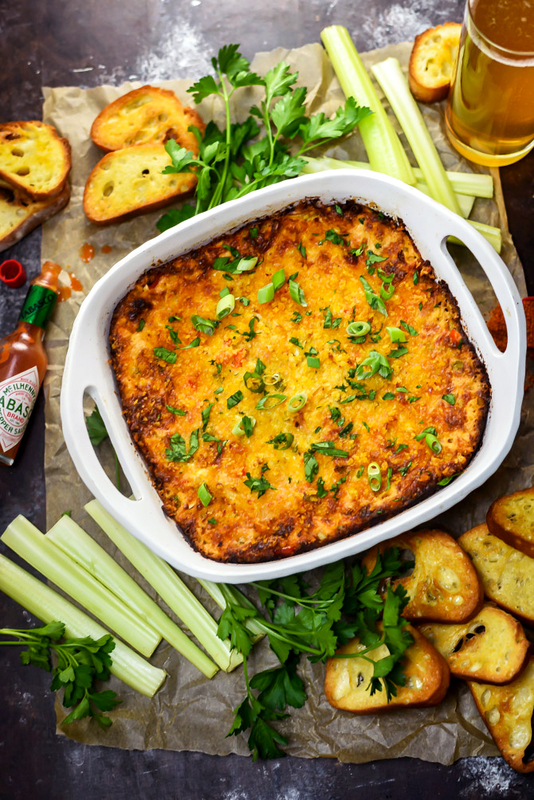 Use any excuse to treat yourself with some Hot Cajun Crab dip because you deserve it for how much you’re rocking this whole resolution thing. Or just eat it because resolutions are so 2017 and you’re past it. You know, whatever. And if anyone wants a mall-walking buddy, let a girl know. I’ll bring the dip once I’m shoveled out. Preheat the oven to 400°F. Spray a 1 quart casserole dish with nonstick spray and set aside. 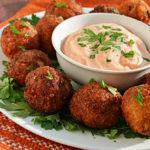 In a large bowl, mix together the cream cheese, mayonnaise, old bay, horseradish, hot sauce, and Worcestershire sauce until well-combined. Fold in the crab meat, cheddar cheese, celery, red bell pepper, and green onions. Transfer the mixture to the prepared baking dish. 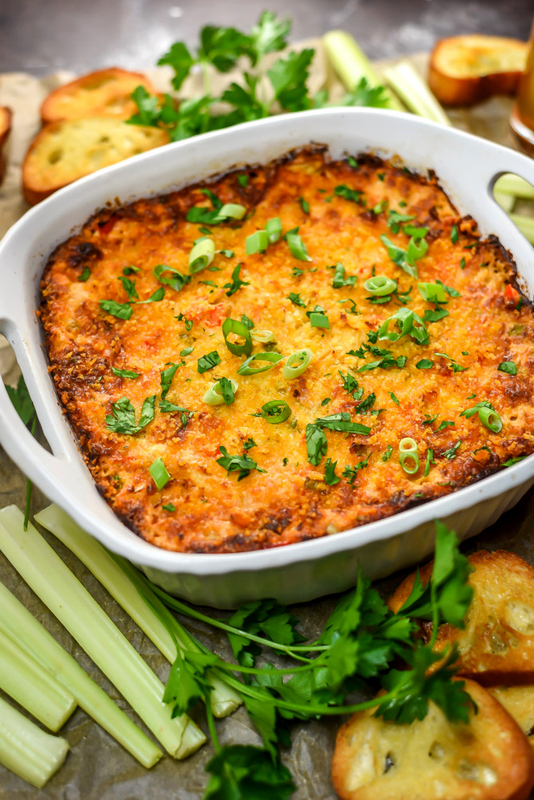 Top the crab dip with panko and spray the top generously with cooking spray to help the panko brown. Bake in the preheated oven until warmed through and bubbly, about 30 minutes. Let the dip cool slightly and then top with parsley and green onions. Serve warm with chips, crackers, toasted bread, and vegetables for dipping. 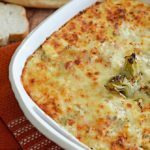 * You can reduce the amount of crab for a more budget-conscious dip if you prefer– I like to pack mine with as much crab as possible but I’ve made it with less and it still turns out great!